Sunshine Kelly | Beauty . Fashion . Lifestyle . Travel . Fitness: Quick, Fun & Tasty Food - Brothers Green Eats! Hello are you running out of idea what to cook today? Hungry in the midnight but don’t feel like ordering fast food? No time to cook but too expensive to eat out? Want to eat healthy? Hey you are not alone these are the dilemmas and concerns that I faced daily too. So I decide to cook something that is quick, simple & tasty meals. I am hungry so let’s cook and eat. Don’t stress too much when comes to cooking, I just cook anything that I can find in my fridge and kitchen. Well, create my own dish is fun. Like fashion and makeup, there is no rule and mix & match is great; same as food too. Usually I have fruits, vegetables, milk, yoghurt, cheese and eggs in my fridge. Oh yes, coming from Penang, I love spicy food so Cili Padi is part of my veg. As an Asian I also stock up some instant noodles, coffee, can food in my kitchen cabinet apart from the healthy food stock. Today I am going to share the Ramelette and Chococado Pudding recipes. Ramelette is ramen omelette, have you try this before? This is one of the quick and tasty plus it’s quite filling too. 1. Boiled the instant noodle. Add some of the instant noodle flavour into the egg and beat it. 3. Heat up the pan and fry the spring onions and the cili padi. Put the omelette in the pan again and add cheese. Fold it into half and let it heat up so the cheese inside will melt. Steps: Blend the flesh of an overly ripe avocado, banana, cocoa powder and a drizzle of honey in a food processor. Garnish with strawberry and banana slices. It looks like pudding… I should add a bit more cocoa powder. It’s done less than 10 minutes and cost about RM12 per glass because the Avocado, banana and strawberry is I get my healthy and energizing Chococado Pudding. Hey if you wish to know and try more ramen noodle dishes like ramen nuggets, ramen pizza, egg drop soup and etc... do check out this video. If you are the type like me who love quick, fun & tasty meals you have to watch the Brothers Green: EATS! 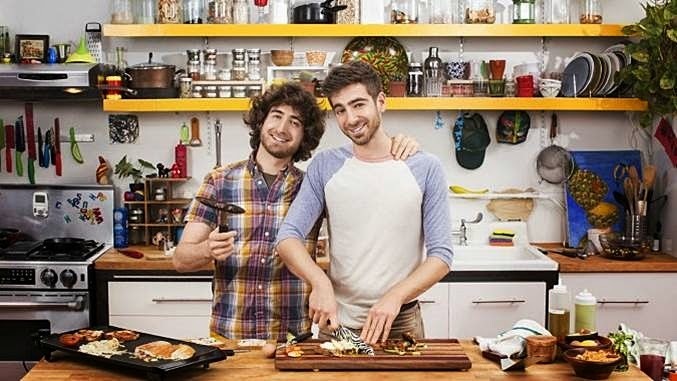 Having taught themselves to cook cheap yet tasty meals out of necessity, after years of feeding college friends and band mates, Josh and Mike drawing inspiration from across New York City and around the globe to put their own spin on traditional recipes and new culinary creations. Now MTV is taking their unique blend of food, music and humour to the world. Brothers Green: EATS! to revolutionize the traditional cooking series with absurdly delicious recipes and incredibly easy food hacks for students in dormitories, those on a budget or professionals who got their new kitchen...and don’t know what to do with it! This is cooking the MTV way! Cooking without specific measurements or inhibitions, the brothers make mouth-watering meals and crazy delicious snacks simple and achievable in even the most limited of kitchens. It's ingenious, I'll never have thought of putting ramen in an omelet. I heard a mamak did that but could never find it after the first time. I'll love to be able to do it at my home.